The Royal Opera's new season continues on the highest level with this revival of David McVicar's 2004 production of Faust. On paper, it was always a mouth-watering prospect, but would the elements come together here to add up to more than the sum of their starry parts? In short: yes. And then some. Not only did we have four great voices in the principal roles here, we also had four charismatic dramatic leads giving it their all, raising, with the help of the production, Gounod's fluidly melodic score to the sort of heights it can rarely have enjoyed in its astonishing 450-performance Covent Garden history. 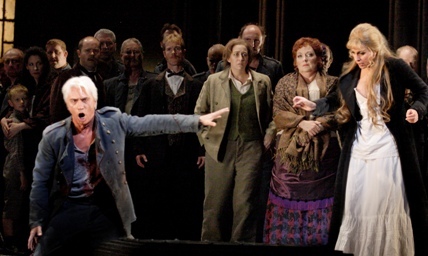 As he so often does, McVicar has updated the action of the opera to the approximate time and place of composition. The gnarly, pre-enlightenment gloom of Goethe is replaced with a flag-waving, bellicose France. The metatheatricality of it all – inherited more from Goethe than Gounod – is powerfully emphasised, and clears the way for the audience to enjoy not only the drama of the action, but also the spectacle and visceral drama of an outstanding cast turning in stonking vocal performances. The action takes place between theatre boxes on the left and cathedral pillars and an organ loft on the right – a clear visual analogue of the work's central tensions. Méphistophélès himself is part impresario, part pimp, his box of tricks a large trunk with a dressing-room mirror inside the lid. Best of all, though, is the way that McVicar relishes in the occasional brutal swipe at the prurient fabric of the opera, instilling in the work an ability to shock, not least in the brilliantly nasty take on the ballet (the choreography, originally by Michael Keegan-Dolan, is revived by Daphne Strothmann). In McVicar's absence, revival director Lee Blakely does an excellent job with his singers. The cast is led by Vittorio Grigolo, who, after his sensational Covent Garden debut last season, had a lot to live up to. He got off to a rather shaky start, though, both vocally and physically, rather overdoing things as the doddery, aged Dr. Faust. The singing was over-wraught, the French bashed around somewhat; there was not much of the philosopher about him. Thankfully, though, things improved markedly as grey beard and wig were (rather unconvincingly) magicked away: rarely can newfound youth and impetuosity have been more energetically portrayed. 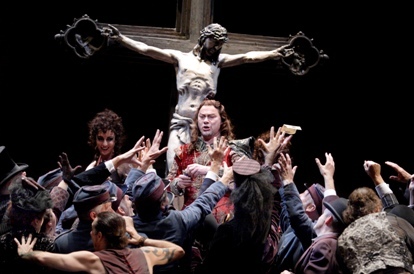 Grigolo is no stylist, perhaps, but the voice is big and bristles with life. Exciting stuff. Angela Gheorghiu is more one for controlled refinement than boundless energy, and, while I occasionally wished Grigolo would take his foot off the throttle, I conversely wished every now and then that Gheorghiu would floor it. Yet, while this Marguerite is exquisitely sung and bit of a slow-burner, Gheorghiu also stays the course brilliantly, achieving genuine pathos in her final scene. Having the Valentin of Dmitri Hvorostovsky, meanwhile, adds a whole new dimension to the drama. The Russian baritone commands the stage at each appearance, giving tragic gravity to Marguerite's usually dull brother. His aria, 'Avant de quitter ces lieux', was despatched with swaggering confidence, while his death scene was unusually powerful. Lording over it all was René Pape's marvellous Méphistophélès, rolling out one generous phrase after another and acting with a irresitible, mischievous glint in his eye. The strong casting extended to an excellent, luxuriously sung Siébel from Michèle Losier and a fine comic turn from Carole Wilson's Marthe, while Jette Parker Young Artist Daniel Grice made a strong impression as Wagner. Evelino Pidò kept things moving along fluently and there was excellent playing from the ROH orchestra and a great contribution from the chorus and dancers. It was as an example of how a top-flight cast can, should but too often doesn't come together that this performance was to be cherished. With this and their excellent new Trittico, the Royal Opera has set the highest benchmark for their 'Olympic' season. This was truly world class.